If you like movies, you'll love this! New CD launch - this Friday night! The leaflet has dozens more reviews; what is interesting from the above selection is (aside from the obvious Burns comparisons) how warm and open the press in Belfast and Dublin were towards the book, never mind in Dundee and Aberdeen. Whilst Northern Ireland's suburban media élite have once again spent their day ridiculing Ulster-Scots, I was in Killinchy and Killyleagh, visiting some local, historically-important, churches. I'll not mention the people by name (just in case the thought police go and hunt them down) but I had a marvellous afternoon talking with local folk, born and bred on the other side of Strangford Lough, about local history and fast-disappearing vocabulary. One of them gave me her personal collection of old yellowed newspaper cuttings of Ulster vocabulary, dating back to the late 1800s - a real treasure trove of information. They also told me of old Ulster-Scots street names in Killyleagh which have been replaced by bland alternatives within their lifetimes - Braeside which led to Breakey's Brae, Barracks Brae (which was changed to Shrigley Road), Sabbath Brae (changed to Castle Lane) - and up near Raffrey, Bratchey's Brae (probably Bradshaw's Brae, just like in Newtownards - but still spelled as "Bratchey's" on a nearby house), which joins the Temple Burn Road. Not that any of these things would interest the opponents of Ulster-Scots. The dominant attitude of the establishment in NI towards Ulster-Scots has always been hostility of one kind or another. That antagonism can be traced back in various forms for centuries. In more recent decades that has included the trivialisation of tradition, the wiping out of old place names and the exclusion of our story from the classroom, or - dare I say it - most museums. I've blogged about that before. The smug, constructed world that today's media and cultural élite lives in is one where they can talk down their noses about 'reinforcing elderly rural protestant stereotypes', and get away with it. Their airbrushed world bears little resemblance to the lives and interests of ordinary Ulster folk. As I've said manys a time, the closest many of these "experts" get to rural life is the car park at Marks and Spencer. I'm posting this in the hope that, one day, these items might surface and perhaps copies of them could be sent back to Ulster in the interests of history and cultural heritage. No-one alive in Ulster today has ever seen these portraits - they are thought to have been taken to Australia or New Zealand by emigrants. In the Preface, Rev George Hill refers to a biography of Hugh Montgomery II (1597 - 1642) - "...The memoir of the second viscount is unfortunately lost, at least for the present, having been probably carried away to Australia by the author's lineal descendant, captain Frederick Campbell Montgomery, who settled in that colony about the year 1835..."
Sir James Hamilton and Sir Hugh Montgomery have been called "The Founding Fathers of the Ulster-Scots". Hamilton's original portrait hangs at Castle Ward, the National Trust property near Strangford. It is a tragedy that 150 years ago, an equivalent original portrait of Sir Hugh Montgomery was in a private collection in Belfast but has since been lost, probably taken to the other side of the world. If you know where these two Montgomery portraits might be - PLEASE GET IN TOUCH!! There may even be a reward for the person who uncovers them, and who helps to return copies of them to the people of Northern Ireland. "...There were several wealthy families with the name Sinclair resident in mid 19th century Belfast. The most prominent were the owners of J&T Sinclair, Merchants and Ship owners, they owned two of the largest mansions in the North of the city, the Grove and Hopefield. Another family were the owners of S Sinclair and Company Linen Merchants who lived in College Gardens and other houses in the South of the city. The only connection of a Sinclair family to the Falls would be in the late 18th and early 19th Century. William Sinclair, a very successful Linen manufacturer, is described as the Falls Bleacher. The family house and business premises were in Mill Street, where Castle Street and Divis street now are. Their very substantial house faced the entrance to King Street. He built Fortwilliam House at the end of the 18th Century but the bleaching business was still carried on at the Mill Street site and they presumably retained their house there. William Sinclair died in 1807 and left three daughters but no sons. Fortwilliam was sold soon after his death but his wife survived him until 1854. She lived mainly in Donegal Place but she would always have been associated with the Falls. To my mind she is the only possible candidate among the Belfast merchant classes of that time. As is not unusual at that time the name appears as both Sinclaire and Sinclair. I hope this is helpful, incidentally William Sinclaire was quite a character with wide interests which included being Chairman of the Society of United Irishmen..."
Don't judge a book by its cover, or a sausage roll from the photo on the packet! I really should be avoiding sausage rolls, but I persuaded Hilary to buy some the other day. (NB: If you're reading this on Facebook, you can read this post in full on my blog). A while ago, Fiona McDonald posted on her blog about this writer, who also features in Dr Frank Ferguson's excellent Ulster-Scots Writing: An Anthology. George Francis Savage-Armstrong (1845 - 1906) was born in Dublin (his father was from Wicklow and his mother was from Co Down) and his wife, Marie Elizabeth, was from Belfast. Her father was Rev John Wrixon, rector of St John the Evangelist Church on the Malone Road. "GFSA" was a prolific writer and poet (full bibliography here). He was Professor of English and History at Queen's College Cork and at one stage was a contender for the position of Poet Laureate. 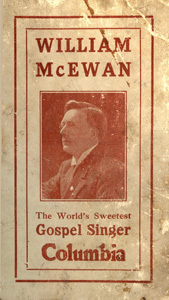 His later writings included much County Down history, as well as "Ballads of Down", a collection of 92 songs and poems published in 1901. Many of these are in Ulster-Scots, which he describes in the glossary as follows - "...the Downshire dialect, with its variants, is an Ulster development of Lowland-Scottish - principally Ayrshire - brought over by Scottish settlers in the reign of James I... the dialect is more or less marked according to the locality and to the degree of the speaker's education. Some of the peasantry have it so strongly as to be hardly intelligible to a stranger...". Even with his own academic pedigree, his English poetry is described in the Dictionary of National Biography as "competent but pedestrian" - nevertheless, "GFSA" retained a sound handling of Ards Peninsula Ulster-Scots. Here's an example of his work, a poem called A Cannae Thole Ye! "...He was antagonistic to the Irish literary revival and was severely criticized by W. B. Yeats. In ‘“Noetry” and poetry’, his second review of Savage-Armstrong's Poetical Works (9 vols., 1891–2), Yeats judged Savage-Armstrong's work to be either rhetorical or crude, but conceded that the ‘Irish’ verses were memorable. In 1898 Savage-Armstrong addressed the Irish Literary Society, London, on ‘The Two Irelands in Literature’, arguing against Matthew Arnold that Gaelic literature had ‘not much style, very little melancholy, and very little natural magic’. He praised the foundation of Trinity College, Dublin as having initiated ‘Irish literary production in the English tongue’ (The Times, 28 May 1898). Yeats responded ferociously, attacking the barrenness and negativity of Savage-Armstrong's Ireland, arguing that he knew little of Gaelic literature, that he represented an obsolete tradition and that he resented being sidelined by the writers of the revival; Yeats's attack was an expansion of his first review of Savage-Armstrong's Poetical Works, in which he had asserted that ‘Mr. Armstrong has cut himself off from the life of the nation in which his days are passed, and has suffered the inevitable penalty’...."
Threatening, almost sinister, stuff - showing that even 100 years ago swimming against the intellectual mainstream was a dangerous activity. GFSA spent the last years of his life at Strangford House where he died on 24 July 1906. 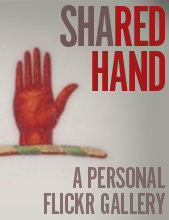 Some of his collected material is held at the William Andrews Clark Memorial Library (UCLA). Francis Savage Nesbitt Savage-Armstrong (5 July 1880 - 23 April 1917) became a Lieutenant Colonel in the South Staffordshire Regiment. He joined the Army on 19 Sept 1900 and served during the Boer War. He served in France & Flanders from 3 Nov 1914, was twice Mentioned in Despatches, and was awarded the D.S.O. (see London Gazette 23 Jun 1915). He was killed in action on 23 Apr 1917 and is interred in the Poit-du-Jour Military Cemetery, France. John Raymond Savage-Armstrong (13 May 1882 - 1918?) became a Captain in the 4th Leinster Regiment. He was wounded at the "Battle of Hill 60" at Ypres in April 1915, and was released on sick leave. He seems to have returned to Strangford House - Northern Ireland's Digital Film Archive contains two of his letters which were written around the time of the 1916 Easter Rising - one written to him by a Miss Julia Taylor of Dublin, and one written to him by his son (also called Raymond). Arabella Guendolen Savage-Armstrong served as a nurse at the Richmond Military Hospital during World War I, and after this, was active in social settlement programs like the Hackney Girls' Club, the Pell Street Club and the Sandes Soldiers' Home at Magilligan, Co Londonderry. IMHO, the Ulster-Scots material in "Ballads of Down" is worth reprinting for today's generation. (NB: If you're reading this on Facebook, you can read this post in full on my blog). Tonight saw the launch of the Thomas Smith booklet. The Londonderry Room in the Old Town Hall in Newtownards was packed with a cross-section of local folk, local historical societies, individual historians, councillors, Jim Shannon MP, Nelson McCausland MLA (Minister for DCAL), the Mayor of Ards Cllr Billy Montgomery, and many more. After the introductory remarks from Hammy Gregory (Loughries Historical Society), the Mayor and Jim Shannon, I spoke for about 30 minutes using a Powerpoint presentation as a visual aid to summarise the Thomas Smith story. The reaction from the audience was superb, the booklets flew out the door, and I think we've really managed to put Smith back on the local map. The next step is for someone to buy Craigantlet quarry (I am pretty sure this is close to where Smith planned to build his biggest defensive fort) from its current owners Tarmac and turn it into a hilltop heritage centre with a spectacular 360 degree panoramic view of Belfast Lough, Strangford Lough, Scotland and the Isle of Man! Thanks to everyone who was so enthusiastic this evening; all being well this is just another step along the road of recovering the unique heritage and stories of north Down and the Ards. 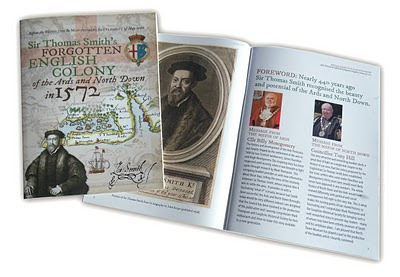 Somebody, some day, will do a PhD on Sir Thomas Smith's forgotten colony - I just hope my booklet helps to bring his story to today's generation. Copies of the 40 page booklet are available from Loughries Historical Society - click here to email them for a copy. Above all - enormous credit goes to Mr Balmoral himself, Mark Anderson of Loughries Historical Society, who is doing a magnificent job in the local community, and schools, in bringing the Ulster-Scots story to the people of the Ards and North Down. Our area would be much poorer without the work he does, and in how he conducts himself - in his own quiet, modest, steady way he has won the respect and confidence of councillors, council officers, teachers, parents and weans. Like Hamilton and Montgomery in May 1606, Mark inherited something of a cultural wasteland, but through hard work he is steadily rebuilding the walls and bringing people in - and like Hamilton and Montgomery's tenants, the seeds he has sown are now reaping a bumper harvest! It sounds like a simple question, but it’s actually very complex. Identity is a complicated issue, and even more so with a long-neglected, marginalised and misunderstood identity like Ulster-Scots. There are many important subtleties that this small article can never adequately cover, so this will only serve as a simple introduction, not a comprehensive study. Hopefully others, better qualified than I, can explore the themes outlined here in more detail. So Ulster-Scots not only refers to these people, and their descendants, but also to their heritage and cultural traditions. The Lowland Scots brought industry, language, music, sport, religion and a myriad of traditions to Ulster. And many of these have become mainstream, not narrow cultural markers, but broad themes in our society. None of these things were fossilised, frozen in a 1600s timewarp - the traditions have developed, changed and grown over time. In Scotland, what were once only markers of regional Highland identity have over time become markers of national Scottish identity. 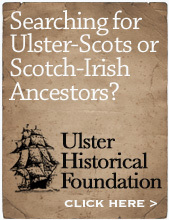 In the same way, some aspects of Ulster-Scots identity have adopted Highland influences too. • Rev Henry Henderson (1820 – 1879) of Holywood wrote a column entitled “Ulster Scot’s Letters to his Friends at Home and Abroad” in the Belfast Weekly News under the pseudonym “Ulster Scot”, from 1869 – 1879. When he died, his son William carried on the column as “Ulster Scot junr”! • The book Three Wee Ulster Lassies, published in London in 1883 includes three characters – Nelly Nolan the Ulster-Kelt, Bessie Stronge the Ulster-Saxon and Jennie Scott the Ulster-Scot. • Edinburgh author John Harrison published a series of articles, and later a book, in 1888 entitled “The Scot in Ulster” where he uses the term Ulster Scot throughout the text. • In 1912 the US Ambassador to Britain, Whitelaw Reid (himself of Co Tyrone descent) delivered a lecture in both Belfast and Edinburgh entitled The Scot in America and the Ulster-Scot, which was later published as a book. • In 1914 James Barkley Woodburn published his epic 400 page volume The Ulster-Scot - His History and Religion. The pedigree of the term “Ulster-Scot” is undeniable. Shouldn’t it just be “Scots in Ulster”? At what point did the early settlers cease to be simply Scots in a different land, and become something else? Some would say that by the 1650s when the first generation of Ulster-born Scots were becoming adults there were clear signs of them being different than the mainland Scots their parents had left behind. For example, when some of the Ulster-based Presbyterian ministers went back to Scotland in the late 1630s, the Scottish ministers were not impressed by some of the religious practices they had developed in Ulster; in 1640 the General Assembly criticised many of these practices as "Irish innovations". So even by 1640, the cultural practices of the Ulster-Scots were becoming slightly different from those of their Scottish kinsfolk. And this process of change and adaptation would continue, right up to the present day. When you glance across some of the key chapters through history - from King Robert the Bruce’s links with Ulster in the 1300s, to the organic settlements and organized plantations of the early 1600s, the period of Covenants and “Killing Times”, the great popularity of Robert Burns in Ulster, the Scottish Enlightenment of the 1700s and the role played by the Ulster-Scot Frances Hutcheson, and the great industrial partnerships that linked the shipyards of Belfast and Glasgow throughout the 1800s and 1900s – it’s clear that the Ulster-Scots story is of massive significance to both countries, and to people on both sides of the slim stretch of water. At the narrowest point, only 13 miles of sea separate Ulster and Scotland. In 1606 the sea crossing took just three hours, and today it’s not much faster! Scots and Ulster-Scots folk alike have much to gain by strengthening our deep historic ties, and to understanding the Ulster-Scots story. © Mark Thompson, June 2009. (this article appears on the website of the Ulster-Scots Agency). The story of Britain's maritime past has a hidden history of shanties and sea songs, and choirmaster Gareth Malone has been travelling Britain's coast to explore this unique heritage. From dedicated traditionalists to groundbreaking recording artists, Gareth meets a variety of sea-singers from across the country. His journey begins in Portsmouth where he meets a devoted shanty singer, before continuing on to Tyneside and the Yorkshire coast, where the Filey Fisherman's Choir, with an average age of 70, are determined to keep the tradition alive. Gareth gets a fascinating insight into the songs of the Herring Girls when he visits Gardenstown in Scotland. In Whitby, he meets Kimber's Men, a local group who have dedicated themselves to writing and singing songs celebrating heroes of the sea, such as a rescue of 1881 when the sea was so rough the people of Whitby had to carry their 2-tonne lifeboat some six miles overland on a wooden trailer and in heavy snow to the bay where a ship had hit the rocks. Despite the exhaustion, they still managed to rescue the shipwrecked crew and passengers. Gareth's journey ends in Port Isaac in Cornwall, where a group of local fishermen sing shanties and sea songs alongside their day job. Calling themselves the Fishermen's Friends, they have been so successful that they have landed a lucrative record deal. Go to about 25 minutes in to hear a wee flash by Filey Fisherman's Choir of Londonderry man Henry Gilmour's mighty hymn "I've Anchored My Soul in the Haven of Rest". Great television, great music - a perfect example of how traditional cultures can be treated with respect and insight to produce compelling programmes. If you're going to emigrate, why not take your all of your friends, family and neighbours with you? (NB: If you're reading this on Facebook, you can read this post in full on my blog). You might know that my brother Graeme and I are continuing our amateur-acoustic-old-fashioned-Ulster-Scots-gospel-music efforts by launching our new CD - Soda Farls and Redemption Songs - this Friday night, up at McKee's Country Store and Restaurant in the Craigantlet Hills - it's an open invitation evening, starting at 7.30. The music will last for about 45min to an hour and will be divided equally into two parts - us playing songs from the CD for half of the evening, and good communal singing from "Redemption Songs" for the other half. McKee's are going to leave the restaurant tables in position, and wlll be serving tea and shortbread to your table throughout the evening. During the singing their bakers will be making the soda bread, which will be served fresh and warm to your table at the end of the music! You can listen to some samples from the CD here. 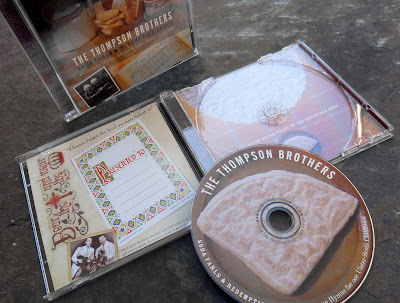 The cd (shown here - click to enlarge) will be on sale for £10.00. We've worked hard on the packaging and booklet - the CD even has a soda farl printed on it! It should be available in the usual shops over the next few weeks, but we're also selling direct - you can place an order by clicking on "Buy The CD" here. Hope to see you on Friday evening - music starts at 7.30! "...Mr and Mrs Hall, who toured Ireland in 1840, described the people of the coastal areas of County Down as being quite different because of the close approximation of the Scottish coast. The faces they met had a "square, stolid and "look forward" sort of expression, the cheek bones were high and broad, the eyes somewhat sunk and blue rather than black and grey, the complexions were still what they call "sandy" in Ireland. A Scotch-Irish dialect was, and still is today, particularly strong in the Middle Ards in and above the saltwater marsh..."